Slightly larger than Dunlin with shorter, straighter bill. In winter, easily told by very pale plumage with often a dark mark at bend of wing. 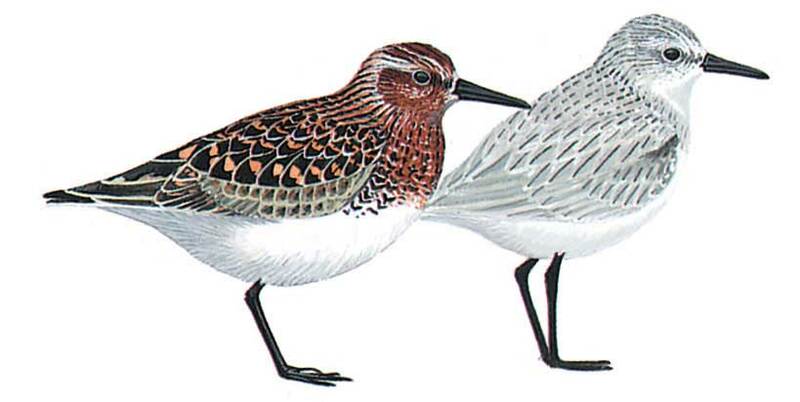 In summer and juvenile plumage more confusable with other small waders, particularly stints, especially if comparison is not possible. In summer plumage (often shown on spring passage), can be quite rusty on head and prominent breast band, but always shows dark scalloping in the red of the breast. Juveniles (on autumn passage) spangled black and white on upperparts, sometimes with buff wash on breast sides. Noticeable white wing-bar in flight, more striking than in other smaller waders; often runs fast along shoreline.